Civil unrest continues in parts of South Sudan. In Juba, Jhpiego staff remain steadfast in their efforts to ensure that women and families receive quality, lifesaving care. This is the story of Dr. Alex Abuk, HIV Technical Advisor, who remained on the job throughout the turbulent summer, as told to Ann LoLordo, Director of Editorial Services and Communications at Jhpiego. As the bloodshed and civil strife intensified in South Sudan earlier this year, Dr. Alex Abuk’s work—to keep health facilities stocked with HIV/AIDS medicines—became more urgent. And dangerous. Road travel in the country had become unpredictable and risky. Fuel was scarce. Talk of renewed warfare had heightened, prompting many in the development and aid community to close offices there. 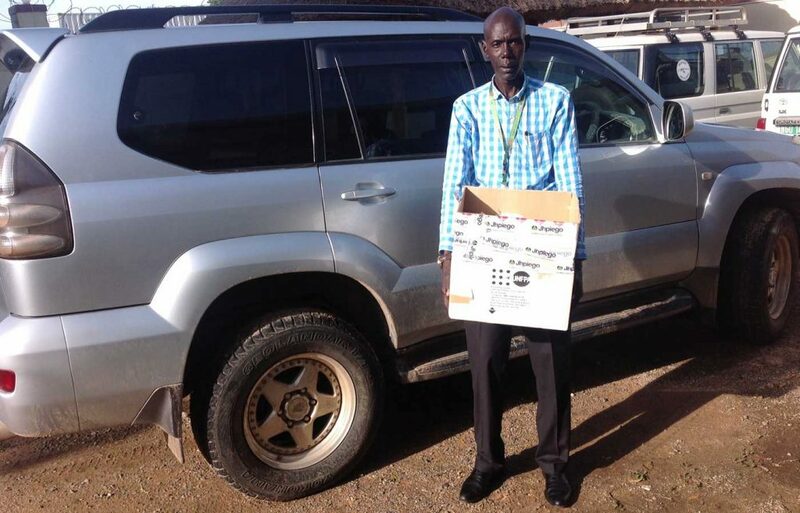 But Abuk, Jhpiego’s HIV Technical Advisor in Juba, had no intention of leaving. He refused to leave his family or abandon his South Sudanese countrymen who relied on antiretrovirals (ARVs) to stay strong and healthy. Abuk recalled one harrowing visit to the Tore Primary Health Care Center, about 48 miles outside Juba on Yei-Maridi Road that he took with coworkers Patrick Ochira and Michael Dirichi. Abuk had access to supplies of ARVs, test kits for HIV and syphilis, antibiotics and HIV prevention medicines for newborns exposed to HIV. Getting gas for his silver Prada 2000 SUV so he could deliver the commodities also was a daily challenge. Jhpiego is working in two states in South Sudan—through the Strengthening the Provision of Primary Health Care HIV Services project, funded by the U.S. Agency for International Development—to prevent mother-to-child transmission of HIV. Through this project, Jhpiego is also partnering with South Sudan’s government to increase access to high-quality pediatric and adolescent HIV care, reduce new infections and keep those living with HIV healthy. During visits to Juba-area health facilities supported by Jhpiego, Abuk recognized the toll the unrest was having on South Sudanese health care providers, and he encouraged them to stay strong, reminding them they were working not just to make a living but to serve others in dire need. “I tried to explain to them that, as health care workers, our job is different from any other work in that we are serving human life, and it is in such circumstances that our service is felt more by the people we serve,” Abuk recalled. As conditions deteriorated, he relied on security training he received from Jhpiego to keep his wife, Helen, and eight members of his family safe. He remembered one July night when gunfire broke out in his neighborhood. As a result of Abuk’s commitment, most facilities supported by Jhpiego maintained services to their clients in July and August. 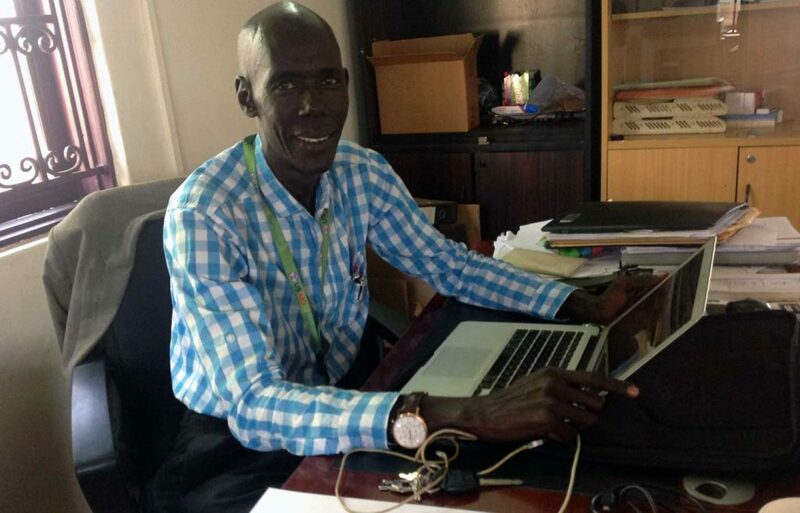 Dr. Alex Abuk is the HIV Technical Advisor in Jhpiego’s South Sudan office.